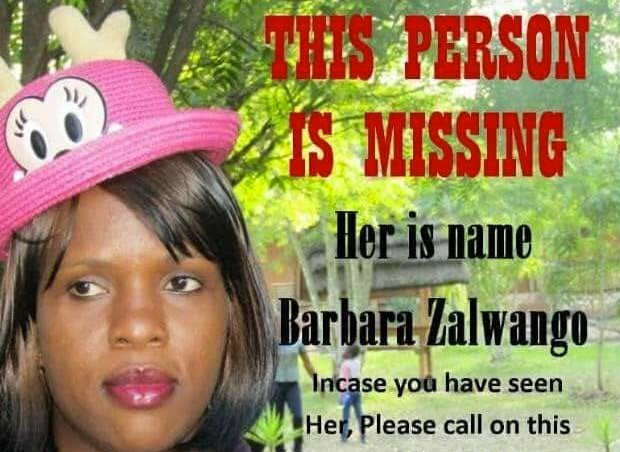 MUKONO – Barely a week since Barbara Zalwango, 36, a banking officer at United Bank of Africa (UBA) was confirmed missing, Police has on Thursday, October 11 revealed that her body was found dumped in Nkokonjeru, Buikwe District. Ssezibwa regional police spokesperson, Hellen Butoto, confirmed that Ms. Zalwango’s body was found at her ancestral village Katwe – Nakisunga in Mukono district. Reports reaching this website revealed that Zalwango was allegedly last seen with a relative at Shoprite along Entebbe Road after she had left her Entebbe residence home in the morning. “Information was got in the night about her death. She was found in Katwe after Nkokonjeru but the investigations were handled under the jurisdiction of Kisoga police in Mukono because they were nearby. No case has been filed with us in that regard. You can contact Luke [Owoyesigyire] Kampala Metropolitan police spokesperson,” Ms. Butoto said. Mr Owoyesigyire said he was yet to get a briefing about the exact spot where Zalwango’s body was picked and its state at the time it was recovered. “She was our banking officer and she never expressed any death threats. She was a diligent and committed staff who had worked with us for over 10 years. We got the news about her death last night [Thursday, October 11],” Ms. Tumuhairwe said. Police said on Thursday that Zalwango informed her husband that she was going to check their farm in Kakiri, Wakiso District but she never reached. She had earlier notified her husband that she was going to meet her sister before she proceeds to the farm. Mr Owoyesigyire said the information shows that the two met at Shoprite Clock Tower where she further informed the sister that she was going to Kakiri farm. The deceased later sent a text to her sister informing her that she had re-routed to her relatives in Nkokonjeru, Buikwe District. After the search by the decease’s husband and sister yielded no result, a case of a missing person was filed at Kampala Central Police Station (CPS) No. SD 20/07/10/2018 before investigators were dispatched to trace for the banker.